The beauty of Second Life may not be understood by people who are not immersed in the culture and get to know others in this virtual community. It is a combination of personalities, cultures and experiences that only the people who spend time in Second Life understand. To some it is just a game. To many others it is a journey of self discovery. Second Life helps people have a voice, go beyond physical limitations and disabilities, share their skills, talents and even make profound connections with people they would have never met in their city, state or even country. Having the ability to communicate with people from all over the world has fascinated me from the very beginning and I am still amazed by the people I meet today. I don’t consider myself an expert in Second Life. I am an elder and with that institutes wisdom. I still bump into walls and struggle hanging pictures on the wall but I do understand the community and how it works. My observation of people and their actions has inspired the majority of my writing. I wonder if my experiences would make a best seller one day. We each have a story to tell as we branch off into our own interests and journeys. For me Second Life has been a part of my life for nearly a decade. It grew from an idea I had sharing my experiences as a newbie with my circle of friends in The SIMS Online. I never thought that documenting what was happening around me would go viral and turn into one of the top news sources in Second Life. The SL Enquirer is a true testament to just how special this virtual world is that I would dedicate years of my life to provide a platform for not only my writers but a bridge of communication between the residents who share the many things that happen here. The positive growth in my personal life has been doing what I love and earning a Bachelor’s degree in Communication & Technology in the process. I have Second Life to thank for inspiring and helping me achieving that goal. My journey has not been easy but my achievements have been worth working hard for. I understand the power of media and the role it plays in the lives of others. At times the pressure of it can be stressful and overwhelming being pulled in different directions and being spread thin. Pleasing people while upsetting others is a hurdle I must get passed often. Sometimes I feel like I am holding a scale and struggling to keep it balanced. I had to accept I cannot please everyone and at times I would be faced with difficult people and situations. In order to survive the demands of my position I had to trust and surround myself with my closest friends for protection and guidance. 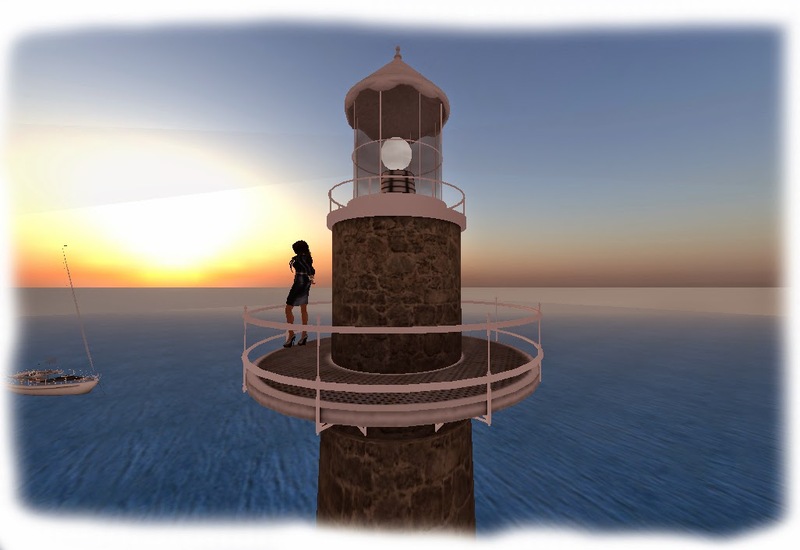 All media sources in Second Life (Not just SLE) play a very important role in the community. Being a leader takes strength and courage. I respect other sources in SL that do what I do. I am sure they can relate to the struggles I face. We are the record keepers documenting SL history and should be respected for how significant our job really is. I’ve been told I was insignificant before, even a useless individual. Those things can be hurtful to anyone but I know what I do is not useless or insignificant. Virtual world media in all genres (blogs, in- world magazines, Machinima and radio) provide a window for the real world where anyone with access to the internet can read about us, listen to or watch pieces of our culture. Fans of our work get to know more about the people that make up Second Life. That is why it is important to remember there is a human being behind ever avatar and our actions will define who we are as individuals. None of us are perfect but if we are capable of managing in a virtual world despite the drama and issues we are presented with, we are competent to make choices that do not disrupt other people’s virtual experience. I speak for us all when I say WE are all connected like pieces to a puzzle. No matter what we contribute to the community our individual actions create a ripple on the grid that can affect others in a positive or negative way. Those emotions may include excitement, happiness, love, lust sadness, angry, confusion and betrayal. Each of these emotions can linger with us even after we log out and into our real world. Sometimes lines get blurred leaving us to deal with new type of emotions not yet fully understood by the psych experts. In Second Life we all live inside our own heads and meet others from the inside out; most of the time through text communication. Sometimes things get misinterpreted or lost in translation when facial expressions, hand gestures and voice tones are absent. Yet, we have adapted, erased the global lines and barriers that keep us all apart and we have grown as a virtual culture. Together we will continue to exist as long as we all strive for one common goal; survival as a community and not as insolents who cannot handle our own freedom of expression. As we approach Spring, the season of renewal, let's bring with us a brighter perspective on the world, strive for personal improvements and celebrate life.